Last edited by mrdragster1970 on Thu Aug 06, 2015 2:48 pm, edited 1 time in total. A list would help...I'd be interested in any Aucoin stuff you might have. Just checking before I waste everyone's time. My stuff is from the Maltais, Martins, Nardella, period. I will get photo's this week, out of town right now. I am sure a list would help generate interest. I know people who collect specific players, so I would be forwarding the list if anything caught my eye for them. 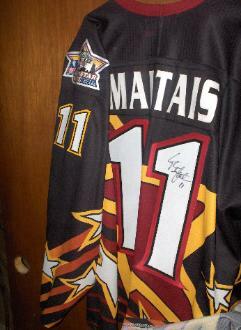 If you happen to have one of the black 2001 IHL All-star game worn jerseys, I would be interested in that. I got some info for everyone, more soon. 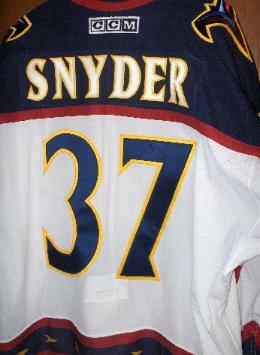 I have Dan Snyder's last 2003 game worn Atlanta jersey. I bought this a few month's before the accident. Yuri Butsayev game worn Atlanta jersey. Also have about 20 more jersey's, IHL & AHL stuff, all star, regular team jersey's, specialty, Alpha Wolf etc. I will be in the hospital 26th-29th, so won't be able to respond until I get home. What years are the st pats jerseys. Working on getting the paper work for each jersey, so we will know each year. The jersey's are stored in a different spot then the paperwork. 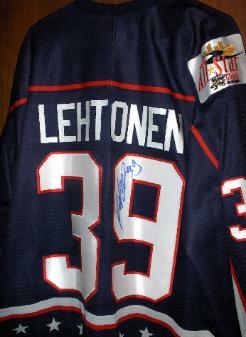 I also have autographed hats and autographed game used sticks matching some of the jersey's. Dave your email is not working??? I'll try again in the morning!! It came back twice already?? I took photo's of a bunch of the jersey's. Will get them downloaded asap. All sticks are actual authentic players sticks, not sovereign, not free give away fake sticks. Some are game used, autographed, or both. All sticks bought at charity auctions, nothing from ebay, craigslist etc. Last edited by mrdragster1970 on Tue May 26, 2015 12:34 pm, edited 1 time in total. Photo's are posted. Please scroll down, jersey's are near the bottom. I'll try to post an example here, but tons more at the link. All bobbleheads still in box, most are un-opened, except for the autographed ones. Bobbleheads are $20 EACH or $30 EACH for autographed item. Last edited by mrdragster1970 on Tue Aug 11, 2015 7:23 pm, edited 1 time in total. Still working on ton's of other jerseys, hats, pucks, cards, misc. souvenirs. I actually contacted his family after the accident and offered it, they never replied. Now I'm sick and my family comes 1st.